Do you remember in the 1990s when fat was THE absolutely most terrible food (macronutrient really)? Yes, it is true that fat has twice as many calories as protein or carbohydrates, but fat is not inherently evil. There are some nutrients that are ‘fat soluble,’ that is, those nutrients need fat to be absorbed (vitamin A, D, E, K to name four). Let’s not forget that fat also makes foods taste good – I believe that this is very important, when we eat food it should taste good. Food doesn’t have to be real high in fat to taste good; a little can do the job. Good health can be yummy! Have you ever noticed when you’re cooking, the instructions frequently tell you to put the herbs or spices into the oil? That’s because the oil absorbs and carries the flavor. Some people even put their garlic cloves into jars of oil to serve two purposes; 1) the garlic lasts longer, 2) the oil becomes infused with the flavor of garlic, and then you can cook with that oil. Are you old enough to remember ice milk, or the first low-fat ice creams? I can actually remember saying, “I’d just as soon have a taste of real ice cream than a scoop of ice milk.” Why? Because if you’ve never tasted it you may not know that it lacked the creamy texture and mouth feel of real ice cream, which is one of the pleasures of ice cream. I know that now the food scientists and food technologists have hit upon some wonderful technology; that they call ‘double-churned’ to give that creamy texture without so much artery-clogging saturated fat. We’ve learned some things from those days in the 1990’s; one is that we need some fat to stay healthy; another is that we need some to feel satisfied (full for a sufficient length of time); also, from a psychological point of view, we need the satisfaction that comes from eating good-tasting food. But does it need to be saturated fat? Or can we cut back on the saturated fat? After reading the results of a study from three universities (Department of Atherosclerosis Research in Oakland California; the Center for excellence in Nutritional Genomics University of California at Davis; and the Department of Nutrition Epidemiology Harvard School of Public Health Boston, Massachusetts) I thought that I should write a little to be sure that our readers are not confused. In essence what the researchers found was that many people are replacing the calories from saturated fat with refined carbohydrates. That substitution is actually not solving the problem at all. The refined carbs (usually white flour products with lots of sugar or corn syrup) are causing our bodies to produce the dangerous blood fats, which lead to the clogged arteries that we’re trying to avoid by reducing saturated fat in our diet. The repeated spiking of blood sugar and the fats produced by our livers from the refined carbs lead to insulin resistance; plus when there is too much glucose from the refined carbs, and not enough exercise to burn it off, it is stored as fat – too much may lead to obesity, which has replaced cigarettes as the leading killer. The substitution of refined carbs for saturated fat is increasing triglycerides, increasing small LDL cholesterol (bad stuff) and decreasing the HDL cholesterol (good stuff). That substitution is just an all-around unhealthy choice. The take home lesson that I hope all our readers are clear on is this: Yes, it is great to limit saturated fat (think whole milk and whole milk hard cheeses, red meat, cream, butter, ice cream, palm oil, palm kernel and coconut oil, cocoa butter). In this article I’m not specifically discussing the trans fats because the study was about saturated fats, but just to review past articles, trans fats are even worse that saturated fats (think cookies, crackers, cakes, French fries, onion rings, donuts). Reducing these sources of saturated fats (and trans fats) is very likely a good thing – lots of research points in this direction. But don’t allow yourself to replace the saturated fats with simple refined carbohydrates. If you read this blog very often, you know that sugar, processed flours, processed starchy vegetables (like whipped mashed potatoes), soda pop, juice and punch, refined snack foods – like chips, crackers and cookies all contain lots of refined carbohydrates. Some people have actually named this bad choice of substitutes for fats the ‘Snackwell Syndrome’. The story of the ‘SnackWell Syndrome’ is this: In the 1990s when fat was ‘THE absolutely most terrible food,’ there were food manufacturers who wanted to meet the needs of the public’s fat phobia (or they wanted to make a buck and keep the stockholders happy). SnackWells came out with their devils food cookies first. What a hit! It was huge –they sold $500 million in annual retail sales within just three years. They were one of the most successful product launches in the food industry. The consumers were gulping SnackWells packages like popcorn. They seemed like a perfect answer to lowering fat. Let’s face it – so much focus was on the high calories of fat. But unfortunately, the consumers didn’t notice how many calories were in the cookies – they were apparently thinking that ‘no-fat’ meant low calorie. Nabisco designed SnackWells to be highly palatable, and to induce the desire for more and more, so I’m sure the decision to buy SnackWells was prompted by this desire as much or more that the thought of avoiding fatty snacks. But there were plenty of calories from sugar and processed white flour in the SnackWells. After a while, people began to notice that the SnackWells were not helping with their weight management goals. The public learned, though belatedly, that calories from refined carbs turn to fat very efficiently and Nabisco’s SnackWells lost that huge market. Although we’ve known about the ‘SnackWell Syndrome’ for a long time, apparently some people are still replacing fat with simple refined sugar and other carbohydrates. It’s not supporting their desire for heart health, diabetes or obesity prevention. So this blog is dedicated to insure that our readers will recognize that if you’re striving for health for you and your family, be careful with the saturated fat AND the refined carbohydrates. If we truly want to “snack well” we should look to whole grain products, fruits, vegetables, and nuts. If they are cooked or dipped, the snack can use a little extra virgin olive oil – a delightful fat that helps with the good things we need fat to do for us. If you have cooked frozen wheat berries, defrost; or cook 2 cups of wheat berries in 4 cups water for about 1 ¼ hour, until tender. Infuse oil with chili flakes – about one minute. 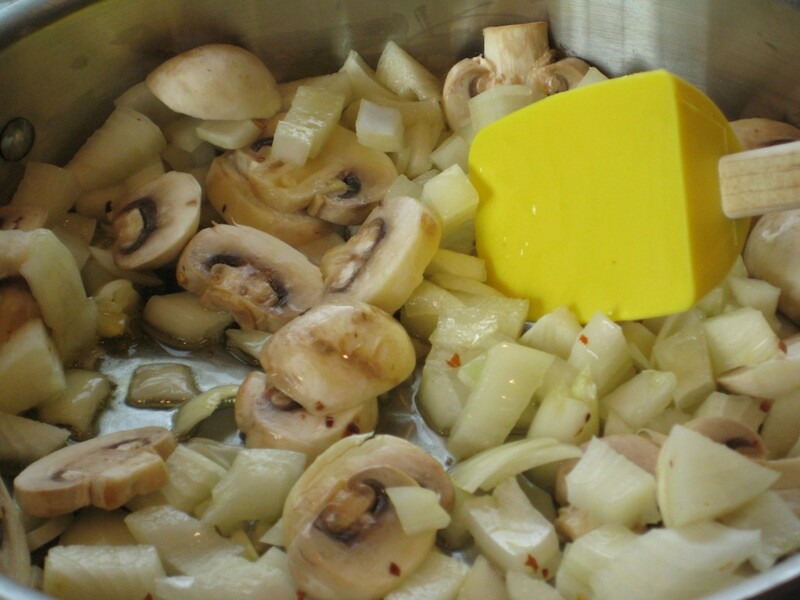 Add onions and mushrooms and sauté until onions are clear – about 5 minutes. 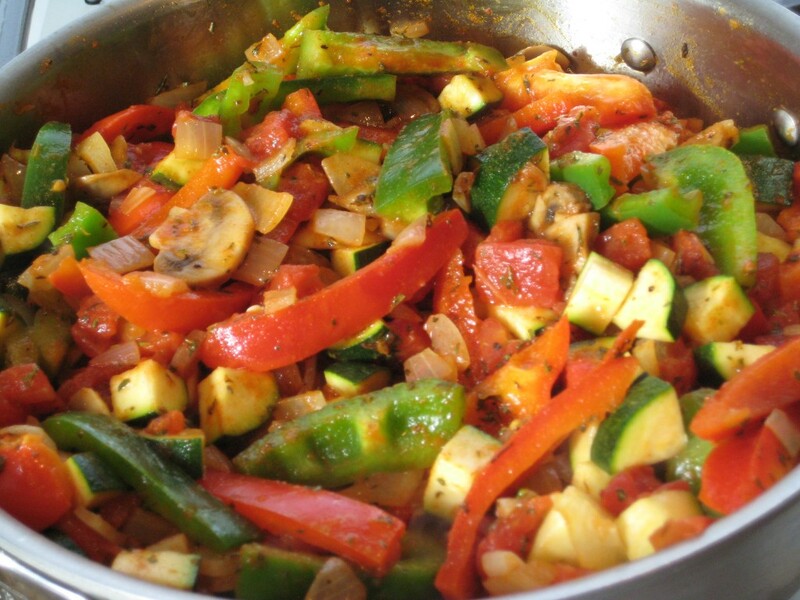 Add the tomatoes, zucchini, peppers, paprika, thyme, oregano, pepper, orange zest, and garlic – sauté until vegetables are tender and all ingredients are heated. 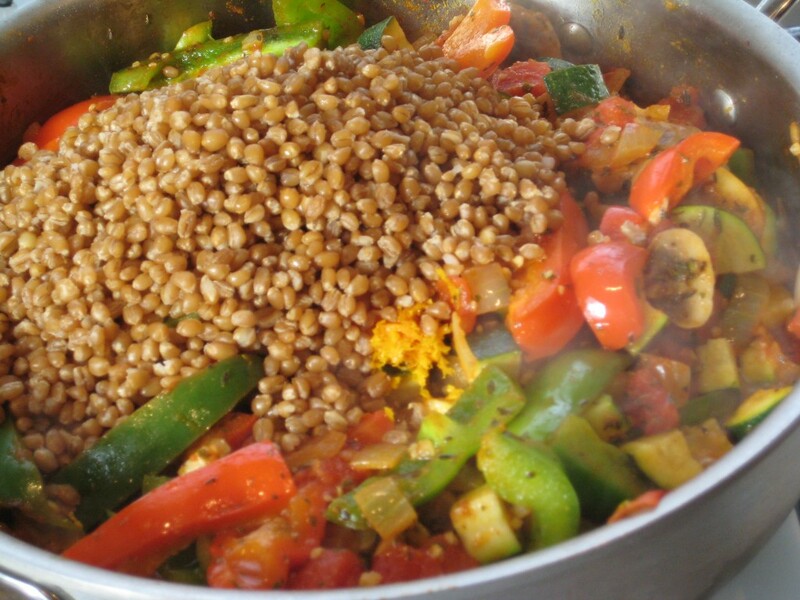 Add the wheat berries and stir together. Add the scallops and shrimp. 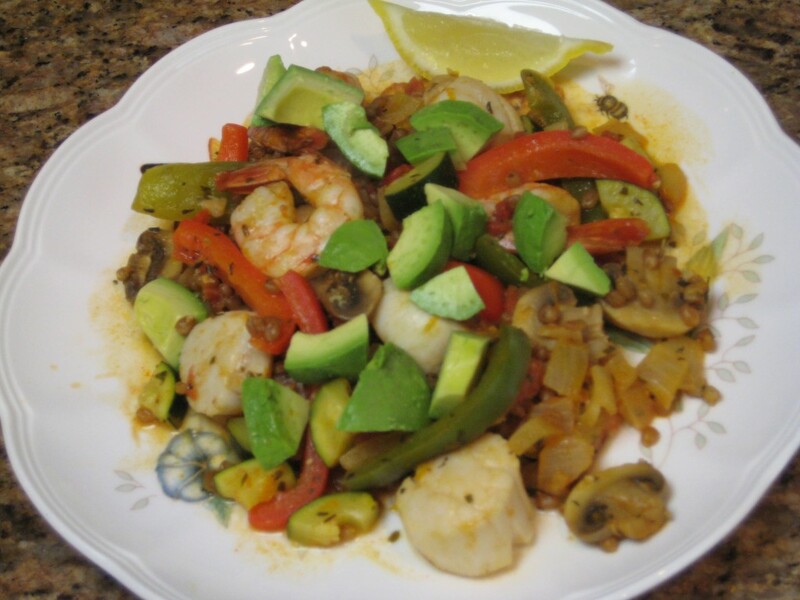 Continue to sauté until the shrimp and scallops are cooked through. Serve topped with chopped avocado and a slice of lemon or lime. Stir pepper flakes, onions, and mushrooms. 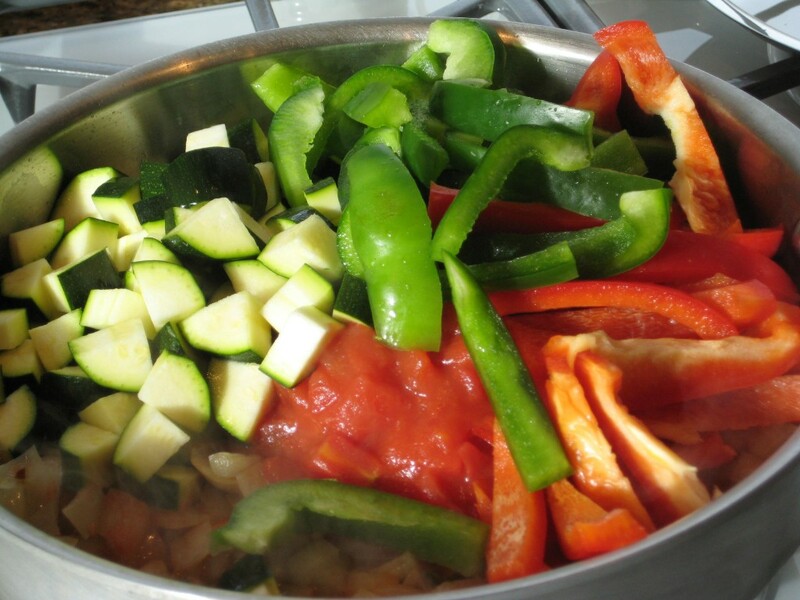 Add the rest of the vegetables. 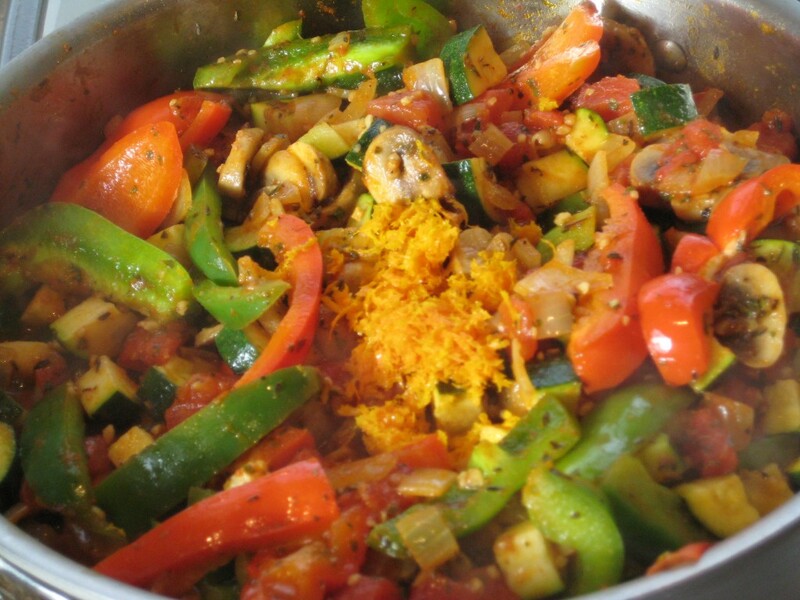 Stir all the herbs and vegetables together. Add the wheat berries and then the shrimp and scallops. Serve and garnish with lemon wedge and avocado. What’s the Big Fat Deal? Wondering What Weird Stuff Is in Our Food? » Alarmed over All the Sugar Toxicity Chat?